Tools for Learning, Tools for Life. Social and Emotional Learning (SEL) is a process for helping children and adults develop fundamental skills for life effectiveness. SEL teaches the skills we all need to handle ourselves, our relationships, and our work effectively and ethically. These skills include recognizing and managing our emotions, developing care and concern for others, establishing positive relationships, making responsible decisions, and handling challenging situations constructively and ethically. SEL reaches beyond the classroom to all aspects of life. Skills and concepts are integrated in academic lessons and practiced to enhance the climate of the school. Out of school time providers and parents reinforce SEL skills as well. Here at Blackshear our SEL team has received explicit instruction materials from Second Step that are taught campus- wide weekly and reinforced in all areas of the school. This website focuses on helping families grow healthy, successful children who can excel in many areas – in the classroom, on the court, and in their relationships with peers and adults. This site uses a developmental lens and the SEL framework to organize their stratgies. It is available in English and Spanish. 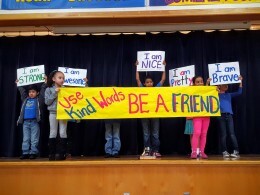 AISD's Respect for All initiative focuses on building awareness and encouraging tolerance through social emotional learning, student-led initiatives and ongoing dialogues. The district's Respect for All website provides important information about the AISD policies that address bullying, harassment and violence, as well as resources for parents, students and educators. Each month a student from each grade level (5 students) is recognized for demonstrating strong SEL smarts such as empathy, courage, being a good friend, or being an example of a classroom leader. Students are chosen collaboratively by their grade-level teachers. These students are recognized during a Friday assembly for earning the honor of SEL Star and get to have a photo taken and placed on display for the entire month. All AISD school's create a steering committee to lead their SEL work that serve as the liaisons with the SEL district department. Each campus also has an assigned SEL specialist, or coach, from central office. The SEL specialist supports implementation on campus by providing professional development, observing lessons and giving feedback on integration of SEL skills as well as explicit instruction, and developing campus plans with the steering committee.